Your biggest hurdle to growing catnip indoors might not be low light levels, cold air, or lack of consistent watering. It might be your cat. Catnip, a perennial favorite of all things feline, is a relative of the mint and lemon balm, which means it's not a terribly hard plant to grow indoors. Outdoors, it's known to spread easily, growing into jumbled patches that attract cats from miles around. Indoors, it can be successfully grown on a sunny windowsill, providing you give it enough water and remember to pinch out the flowers to encourage leaf growth. You can start pinching off leaves as soon as the plant hits about 6 to 8 inches in height; your cat will definitely appreciate it. Aside from cats, the biggest hurdle you'll likely face is a lack of sunlight that leads to leggy plants. While many people report that they like the fragrant, herbal smell of catnip, some people find that it has a vaguely skunky odor to it that is off-putting. Although catnip is a perennial, it's probably easier to grow plants through a single growing season, then replace them with small and more manageable specimens. Light: Catnip is not particularly picky about its light outdoors, but indoors try to give it as much direct light as possible, even up to 5 hours a day of strong sunlight on a bright windowsill. Too little light will cause leggy growth. Water: Catnip likes a steady supply of water, but good drainage is a must. The plant recovers quickly from a wilt, so it's best to err on the side of dry rather than too wet, which will encourage root rot. Catnip propagates easily from both leaf-tip cuttings and seeds. To take a cutting, simply remove a small piece of new growth early in the growing season and pot it up a new pot of sterile potting soil. Give it plenty of moisture and filtered light until new growth emerges. Catnip is also a common herb sold in garden centers, so you can always buy new seedlings and put them in larger pots until it's time to discard the plant. Catnip is a perennial that generally grows to 2 to 3 feet when plants outdoors. Indoors, providing you give it enough light and water, it's conceivable you'll get a 2-foot plant, but in reality, indoor catnip doesn't have the potency of outdoor catnip and it seems more reasonable to grow plants for a single growing season, then replace them either through sowing new seeds or cuttings. If you do want to repot a smaller catnip, go up one pot size and use fresh soil, being careful not to damage the roots. Catnip belongs to the same family as mint (Lamiaceae) and is part of the Nepeta genus. 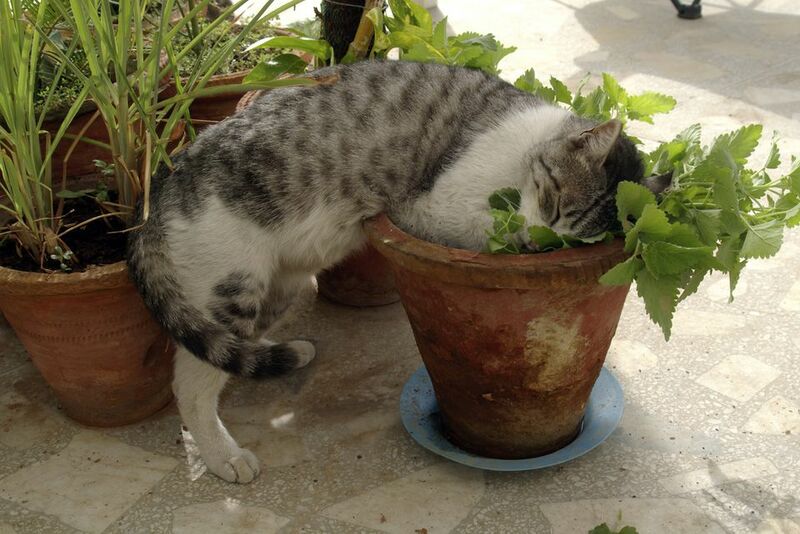 The true catnip plant is N. cataria. There are other Nepata species, but none seem to have the same near-magical appeal to cats. Catnip is not an especially difficult plant to grow indoors. It thrives on sunny ledges, with ample and regular water, and good drainage. If you plant goes into flower, snip off the flower buds to encourage stronger and better leaf growth. Indoor catnip will not have the same potency as outdoor catnip, but your cats will still like it plenty. Be careful not to mist your plant too much to discourage mold growth. Catnip is vulnerable to pests including aphids, mealybugs, scale, and whitefly. If possible, identify the infestation as early as possible and treat with the least toxic option. How Can You Grow Lemon Balm Indoors?